I would like to begin the report on this trip with this quotation from the Messages, as it seemed to all of us that Saint George’s presence and protection were frequently manifest through small signs during the three days of our stay in Lebanon. While visiting the monasteries dedicated to St. George or when meeting Lebanese with that glorious name, « the Great Martyr », as he is called by Oriental Christians, he was indeed there to accompany us. Upon our arrival in Beirut, we were welcomed by Yolla and her daughter Jennifer and were joined shortly after by Georges Chabab. Right away, we went downtown for lunch in a restaurant where the tastes of East and West are wonderfully fused, where tradition and innovation harmonize perfectly. There we met a few Lebanese TLIG readers who told us about their faith and their experience of God. We listened with interest to the testimony of a young musician and composer, Abdo Sadek, who plays piano in a Beirut pub. He told us about a very special experience of the presence and manifestation of the Holy Spirit. On an ordinary working evening while he was playing, he was suddenly overcome with a kind of lethargy; he was without inspiration and very tired. He stopped for a moment to quite simply pray to the Lord: “O Lord, tonight I really do not feel like playing, I am tired, please help me.” From that moment, and to his utter surprise, he began to play as he had never played before. His fingers were flying over the keyboard as if someone else was playing in his place, as if invisible hands had taken control of his own, playing music that seemed to come from somewhere else, so beautiful it was. Everybody complimented him, telling him how he had played exceptionally well that evening. The account of this occurrence reminded Vassula of a similar one which she experienced at the beginning of her conversion. I take the liberty of sharing it, as I had never heard of it before and it seems to me that it can teach us something important. When Vassula was still living in Pully, Switzerland, a priest came to visit her. He asked her if he could say Mass in her home. Vassula agreed quite willingly. That day, she too was very tired and could not concentrate on the Biblical readings; she was easily distracted, her thoughts wandering elsewhere. So, she could not remember one word of that day’s reading. Then, just her luck, the priest asked her for a short commentary on the Word that had just been read! Oops! How would she manage? Vassula was rather embarrassed. How was she going to talk about a Gospel reading to which she had not been listening to? What could she say if she didn’t even know what the subject was? Nevertheless, she put her trust in the Holy Spirit, and suddenly she heard herself speak as if it was someone else speaking. That is to say, it was her own lips that were moving and her own vocal chords that were vibrating, but she was not the one who set them in motion. It was as if she were hearing herself speak from the outside. ( that reminds me a little of the way in which the Lord dictates His Messages). . Moreover, she was speaking in perfect French, in a way she would never have been able to express herself. At the end of her discourse, the priest was quite impressed and astonished by the beauty of the commentary and he thanked Vassula warmly. In the afternoon we visited various local monasteries and met with monks in friendly and brotherly exchanges. The next morning, after attending Divine Liturgy, we went to St. George’s Orthodox Church in Bsalim. 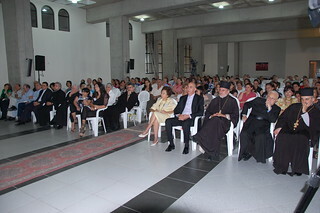 It is still under construction, but there is a vast hall in the basement where the liturgy is temporarily celebrated and where nearly 300 people came to listen not only to Vassula’s testimony, but also to prominent speakers who spoke about Unity. 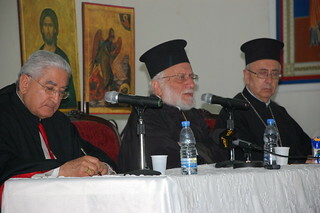 Among the participants at this ecumenical meeting entitled “Union with God and Unity of the Church” were Greek Orthodox Metropolitan Georges Khodor, Maronite Bishop Simon Atallah, Greek Catholic Bishop Georges Kahaleh with Melkite Metropolitan Isidore Battikha, Archbishop Emeritus Boutros el Mouallem and many priests from other Churches. Metropolitan Khodor remarked that it is not solely the doctrine of the Church which will bring about Unity; for nearly one thousand years the Orthodox doctrine has always been “one” yet the leaders of the Orthodox Churches are still divided. So, it is not unity of doctrine that will make the Church “one”, but the heart. It is by renouncing one’s ego, one’s pride, and by trying to do Christ’s will that they will be one. Yes, holiness is what we need. Vassula reminds us that unity will one day become reality, for Scripture says: “that all of them may be one, Father, just as you are in me and I am in you. May they also be in us so that the world may believe that you have sent me.” (Jn 17: 21). We are assured that Jesus will achieve unity because He has promised it. “With My Power I shall unify the dates of Easter, it will not be forced upon you, I shall find a means with Peace.” (TLIG, 27 January 1992) But he wants us to also participate in this unity and work for it. If we refuse to listen to Him and the call for unity ,if we do not want to believe that the simple gesture of unifying the dates of Easter suffices as a humble gesture of participation and that He will then look after everything else. That is when He will come with fire to unify His Church, bringing back his dispersed children to full unity. The choice is ours. 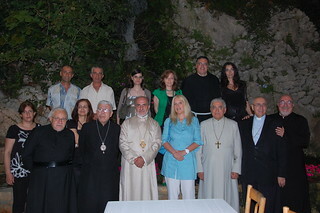 When the witnessing meeting was over, we had lunch with Bishop Atallah, Bishop Kahaleh, Metropolitan Battikha and Archbishop Mouallem, many priests and TLIG readers. 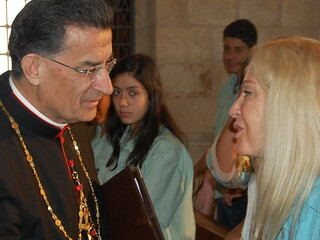 On Monday morning, Vassula and the TLIG prayer group, accompanied by Bishop Kahaleh and Archbishop Mouallem, Fr. 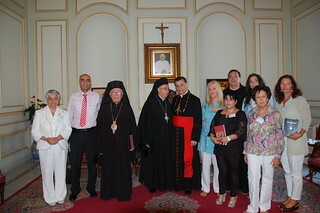 Vincent Cosatti and Fr Elie Battikha, had the opportunity to meet the Maronite Patriarch of Antioch and All the Orient, H.E. Bechara Raï, at his residence at Bkerké. First we attended a program on Christian Education which he gives for the youth every week. . He speaks to them for over an hour mainly on religious themes (the Eucharist, the Word of God) but he sometimes also addresses current events. 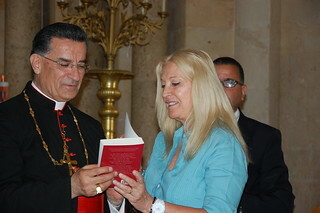 We were then ushered into the great reception hall, at exactly the same place where, in 2005, the former Patriarch, Cardinal Sfeir, had welcomed Vassula and the clergy participating in the TLIG Pilgrimage to Lebanon, Syria, and Jordan. 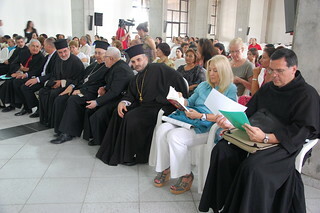 During this meeting which lasted over a quarter of an hour, Vassula had the opportunity to communicate to the Patriarch the Lord’s ardent wish to finally see the Churches being united. According to the Lord’s wishes, she told him what should be our humble participation, the first step to be taken by the Churches, that is to unify the dates of Easter. What came out of this dialogue is that there does not seem to be a real interest in dealing with a problem that, when all is said and done, is of rather minor importance in the eyes of Church leaders, Catholic as well as Orthodox. What they consider most important is to be united in the life of the Paschal Mystery, that is, in believing and living personally the mystery of the Passion, death and Resurrection of our Lord Jesus Christ (until the last doctrinal questions are settled). But, if the life of the Paschal Mystery is so important (and it truly is), then why is it that we cannot manage to celebrate this Mystery together? What would we think, indeed, of a couple who would celebrate their wedding anniversary on different dates? What if one would celebrate it on the anniversary of the civil marriage and the other on the anniversary of the religious marriage? People might say: “Look, they say they love each other and yet they cannot even celebrate together the anniversary of their marriage although it marks the beginning of the consecration of their love?” What also would we say of a country, which would celebrate its national holiday on different dates depending on regions? What if one region would celebrate it on a certain day and the other on another day? Would that be a unified country even if they all share the same values? Indeed, what is most important is that every Christian personally lives the Paschal Mystery, mystery of the love of God and men, but it is equally important for us to manifest in a visible way, that this Paschal Mystery is at the heart of our faith. That is why our Lord asks us to humbly bend in celebrating together the memorial day of this fundamental event. We didn’t leave the residence before paying our respects to Cardinal Sfeir, who still resides there. More than words, his look, always marked with serenity, expressed his thanks for this short visit. 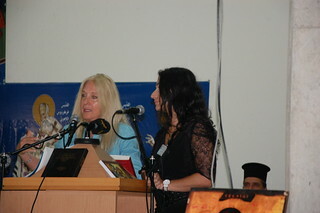 It was with hearts full of gratitude to the organizers that we left Lebanon the next day. They had worked so hard, with so much zeal, kindness and sympathy to allow the prophetic Message of True Life in God to be spread once more. May God reward them a hundredfold for their efforts.